Hyde Park, NY – As the world’s premier culinary college, The Culinary Institute of America strives to be a responsible steward of the environment and to instill the importance of sustainability to its students—the food industry’s future thought leaders and policymakers. 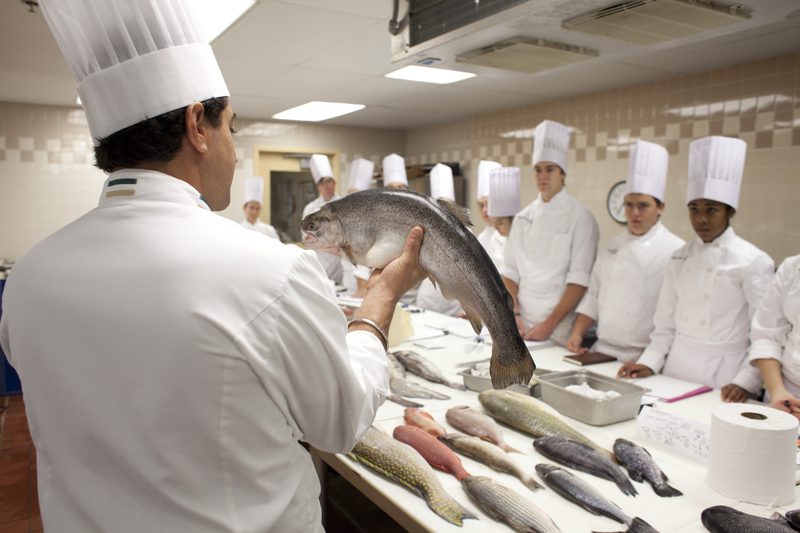 The New York campus spends about $750,000 a year on seafood. Five years ago, around 25 percent of those purchases were of species considered unsustainable. On the eve of the 2016 International Sustainable Seafood Day, March 18, that figure is down to five percent by volume. The CIA has been working with the Monterey Bay Aquarium Seafood Watch program to source as much sustainable seafood as possible for the five public restaurants and 42 teaching kitchens at the college. “The commitment by The Culinary Institute of America to sourcing ocean-friendly seafood is really significant,” says Sheila Bowman, manager of culinary and strategic initiatives for Seafood Watch. “When a respected educational institution makes sustainability a centerpiece of its curriculum, it reinforces for new generations of chefs the importance of incorporating sustainable sourcing into decisions about how to build their menus. There are just three or four species on the Seafood Watch “avoid” list that the CIA still uses, mostly in small quantities and only because students need to be exposed to preparing these fish as part of their culinary education. In addition, the college takes into account the environmental impact of, say, shipping a sustainably caught or farmed fish 4,000 miles versus buying a small quantity of another species caught closer to a chef’s home kitchen. The mission of the nonprofit Monterey Bay Aquarium is to inspire conservation of the ocean. The Monterey Bay Aquarium Seafood Watch® program empowers consumers and businesses to choose seafood that’s fished or farmed using responsible methods that protect sea life and habitats, now and for future generations. Seafood Watch’s widely recognized and respected science-based recommendations, indicating which seafood items are “Best Choices” or “Good Alternatives,” and which ones to “Avoid,” are available using its mobile app, www.seafoodwatch.org/seafood-recommendations/our-app, and at www.seafoodwatch.org.